Looking for a New Jaguar E-PACE in your area? CarGurus has 174 nationwide Jaguar E-PACE dealers with 4,183 new car listings. Jaguar added the E-Pace subcompact crossover for 2018 to take on the established German luxury automakers like Mercedes-Benz and BMW. Built on a similar platform as the Ranger Rover Evoque and Land Rover Discovery Sport, the E-Pace joins Jaguar’s original SUV, the F-Pace, and the all-electric I-Pace. Trims include Base, S, SE, and HSE, the last of which is only available with the R-Dynamic package. All E-Paces sold in the U.S. are all-wheel drive (AWD). Under the sculpted hood of the E-Pace is a 2.0-liter turbocharged 4-cylinder available in two different specs, either 246 or 296 horsepower. The engine is mounted transversely rather than longitudinally, a first for Jaguar. The engine drives all four wheels through a 9-speed automatic transmission. A top-spec E-Pace can get from 0-60 miles per hour in a little more than 6 seconds with a top speed of 143 mph. The E-Pace will manage 21 mpg city, 28 highway, and 24 combined with the 246-hp 4-cylinder. With the 296-hp engine, mpg drops by 1 mpg for highway and combined. The E-Pace’s AWD system can shift power output almost completely to the front or rear depending on road conditions. 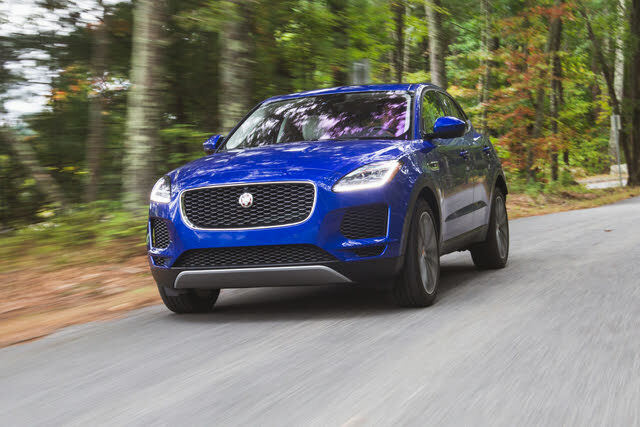 Buyers who opt for the more powerful version of the E-Pace get Jaguar’s Active Driveline system, which can shift power from side to side as well as from front to back. The system can make the E-Pace a rear-drive automobile in desired situations. Top trim levels also come with variable dampers. While it’s related to the Land Rover Discovery Sport and Range Rover Evoque, the E-Pace features an interior similar to the F-Pace. With the Base trim, the E-Pace gets cloth upholstery, a keyless ignition, a 10.0-inch touchscreen infotainment system, and dual-zone automatic climate control. Step up to the S model to get power-adjustable leather seats, navigation, and parking sensors. The SE trim adds a power tailgate, an improved stereo, and advanced safety features. Adding the sporty R-Dynamic package to either the S or SE trim gets drivers access to the more powerful engine, along with sport seats with contrast stitching and paddle shifters. At the top of the heap, the R-Dynamic HSE has softer leather upholstery with adjustable bolsters and thigh support, a motion-activated tailgate, and a head-up display (HUD). While the E-Pace hasn’t gone through the full run of crash tests, most trims come standard with features like forward-collision warning with automatic emergency braking and blind-spot monitors. A surround-view camera is also available. The E-Pace competes against the Mercedes-Benz GLA-Class, Audi Q3, BMW X1 along with its cousins from Land Rover. But the Jaguar is bigger than its German competition and better looking as well, so it has a lot going for it in a competitive segment of the market. What's your take on the 2019 Jaguar E-PACE? Have you driven a 2019 Jaguar E-PACE? Enter your zip to see incentives for a new E-PACE in your area. CarGurus has 1,717 nationwide E-PACE listings starting at $33,995.